If it’s not on your travel list yet, we hope that this post will convince you that Ireland is a real-life fairytale adventure that should be at a top spot on your list. We’ve been wanting to share with you our travel experience to Ireland for quite some time now, and seeing as it’s March with St. Patrick’s Day approaching, it gives us the perfect opportunity to share it and celebrate Irish heritage! We had such an incredible time, and were absolutely blown away by the breathtaking landscapes, warm hospitality, and charming towns. 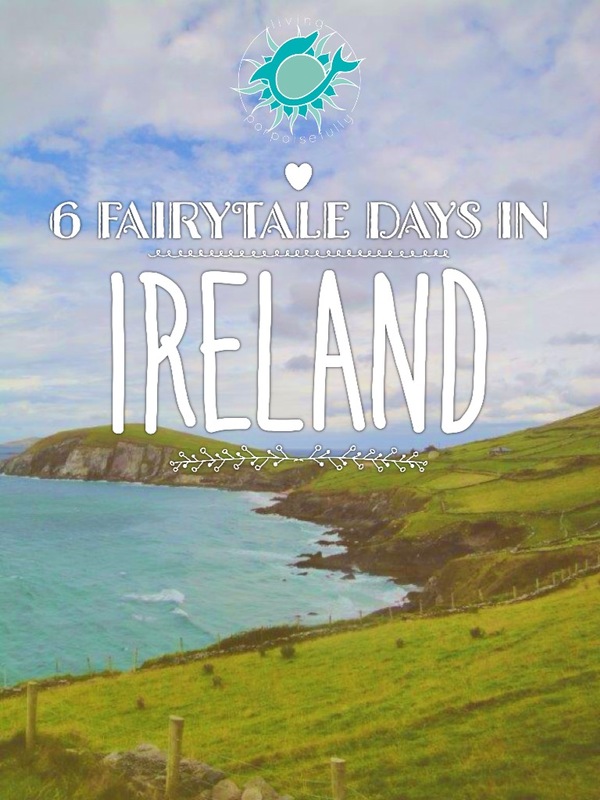 So get ready for a picture feast of each magical day we had in Ireland! Our magical adventure started in Killarney, after a long day of travel and having arrived in the Shannon Airport. On the way to our hotel, we saw beautiful landscapes, windmills, and even stopped to see a castle (!) along the way. After a cozy night’s sleep in Killarney at the Ross Hotel, we boarded our tour bus and explored the breathtaking Ring of Kerry, an 111 mile path that passes through towns and sights of southwest Ireland. …And on the way to Sneam, we passed castle ruins, green pastures, the statue of the famous goat named King Puck, and of course, stunning landscapes. We stopped in Sneam to enjoy the town, some shopping, and an Irish lunch of fish and chips. Continuing on the Ring of Kerry, we were met with the most awe-inspiring scenes, the kinds that leave you speechless and quiet in the beauty of it all. Being able to look out the window of the tour bus, we saw sheep along the road, windmills, epic fields of green, and even a dog herding a flock of sheep for his master. We ended the day back in Killarney, just in time for dinner. Can you believe that all of those sights were in ONE day? Absolutely amazing. The next day, we went to Dingle Peninsula, and again had our breath taken away by the scenery. We stopped at Inch Beach, which was quite the impressive expanse of beach! We admired the brave surfers riding the waves in the cold surf, and found hidden treasures like crabs and snails among the seaweed. Arriving at Dingle Peninsula, we were awed by the crashing waves that have been etching the rocky coastline for eons. Getting a view of the cliff-lined coast from our perch on the hilly landscape above, while the wind put tangles in our hair, made for quite an effect. The tour bus continued on its trek, and we snapped this shot of the treacherous cliffs while seated inside the bus…what a spine-tingling thrill! We stopped in the town of Dingle for lunch and some sightseeing of the town. Dingle is famous for its resident dolphin, Fungie, and has tour trips that go out to see him. We didn’t have time to take a boat tour, but enjoyed the marina views and the bronze statue of the famous dolphin. On the way back to Killarney, we were graced with an Irish rainbow and lots of blue sky! When we returned from Dingle, we spontaneously decided to go on a jaunting car ride (horse drawn carriage). It was one of our richest memories, seeing the town and National Killarney Park in its dewy glory this way. Amidst the lush green forest, we saw deer, birds, and the Ross Castle! It must have been our lucky day, because we saw another rainbow on the way back. After another magical fairytale day, we enjoyed a spectacular feast and then a good night’s sleep. Leaving Killarney was tough, but our tour kept us moving, and it was onto Blarney Castle! It was like we were transported back in time, imagining the people and what life must have been like living here. What a magical place, with towers, gardens, and bridges. Leaving Blarney Castle for Dublin, we passed another castle (Cahir Castle) that was right in the middle of a city ! In Dublin, we explored the city on foot, getting a taste of the city life. There were beautiful buildings, a beautifully landscaped park in the middle of it all, and plenty of shops to satisfy any shopping itch! In the midst of a rain spell, we stopped for some much needed hot chocolate. St. Patrick’s Cathedral was, to say the least, astonishing. Inside, the stained glass windows, precise architecture and arches, and the lifelike marble statues left us in awe of the artistic and engineering talents who created it. We enjoyed more of the city, a spectacular lunch, and shopping for Irish treasures. On our final day before departing Ireland, we caught a U.S. college football game at Croke Park! During halftime, we even got to see a heroic display of Gaelic Hurling, the exciting Irish field sport with ancient roots. We, along with the rest of the crowd, were on our feet in captivated anticipation, cheering at the fast paced game and their displays of athleticism. After the spectacular sporting event, we joined the throng of people milling down the streets of Dublin. What a sight to wrap up our fairytale trip! Visiting Ireland was a magical experience like no other. From the majestic land- and seascapes to the charm of each and every town, we felt as if we were in a fairytale…yet somehow completely at home too. We will never forget our experience of Ireland, and would absolutely go back in a heartbeat. We hope you’ve enjoyed our real-life tale, and that it inspires you to have one of your own. Thanks, Dinah – it was definitely a bucket list trip!